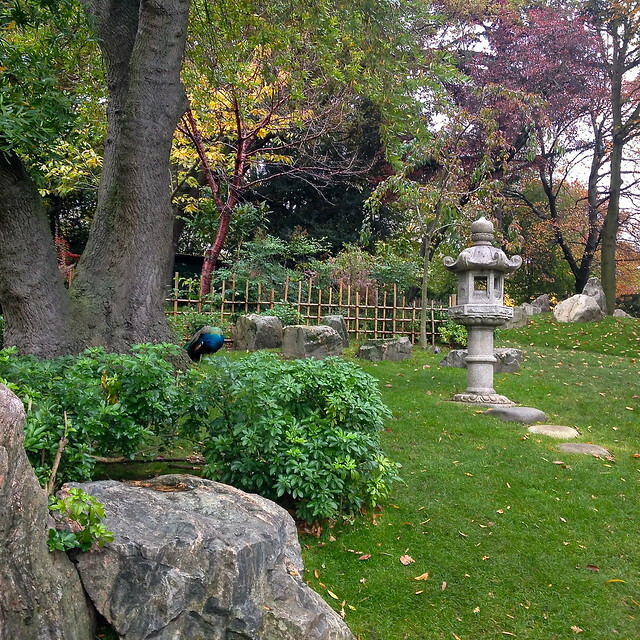 On Saturday afternoon I joined a select group of people on Yannick Pucci’s guided tour of Holland Park. The last time I was there was on a roasting hot day in July when the Fukushima Garden was officially opened by the Japanese Ambassador (see my blog post) so I was interested to see how the new garden had settled in and also to learn more about the long-established Kyoto Garden. 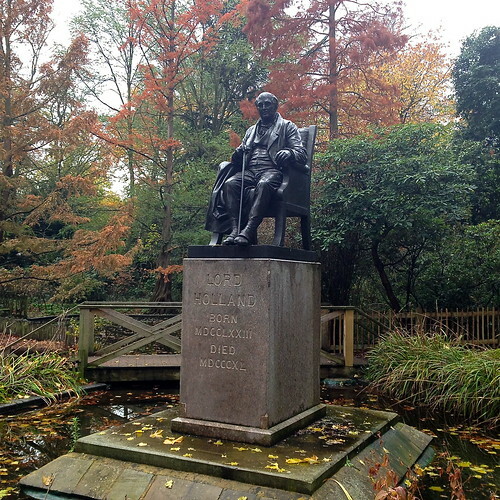 I was in safe hands with Yannick; he really knows his stuff, not just about the parts of Holland Park that particularly interested me but also about the rest of the garden and its history, starting with the nineteenth century Lord Holland whose statue rises from a pond in the woodland part of the park. 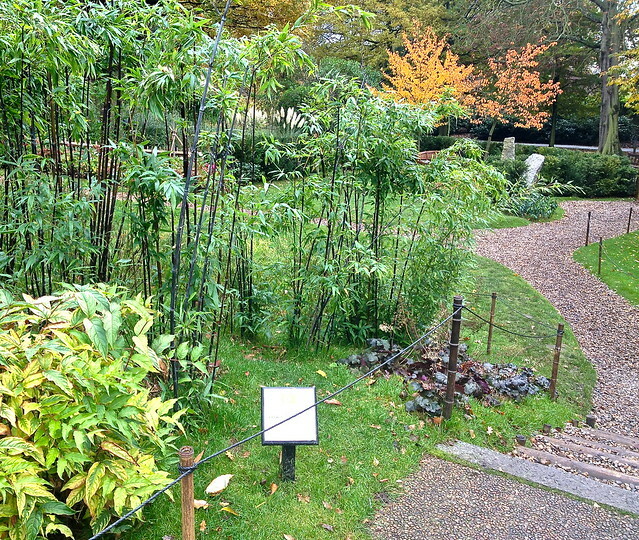 We entered the Kyoto Garden through the main entrance as Yannick explained you were meant to go round it clockwise so it unfolds before you in a particular order, like the unfurling of a scroll. 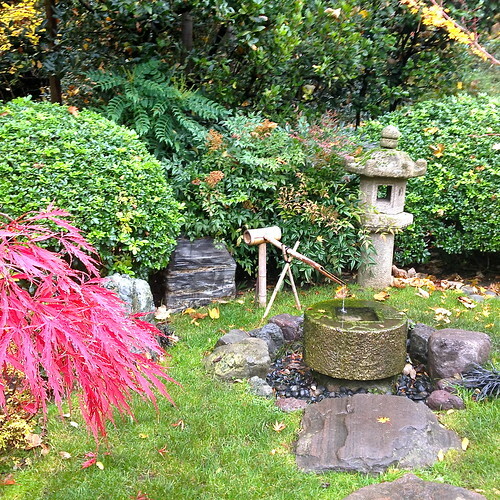 The waterfall is a beautiful central feature of the garden. 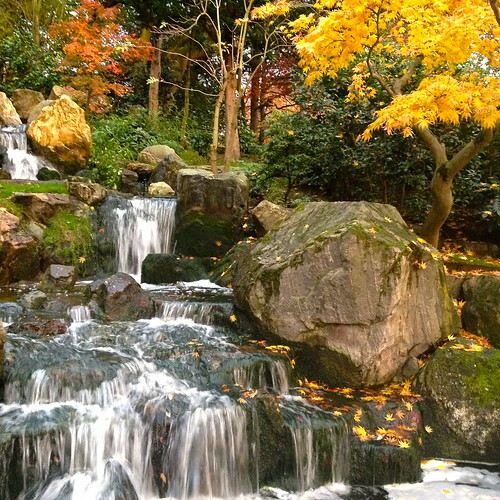 Yannick told us that the contrast of the water and rocks in the waterfall represented the contrast of yin and yang. 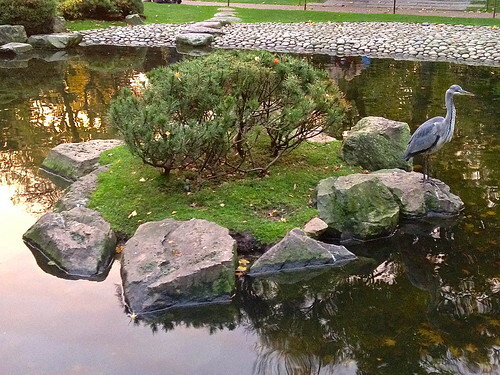 He suggested that the little island in the centre of the pond could be seen as a turtle (turtle and crane being common motifs in Japanese gardens and turtles are also a symbol of longevity) and I could see what he meant – in this picture the heron is sitting on the turtle’s head. 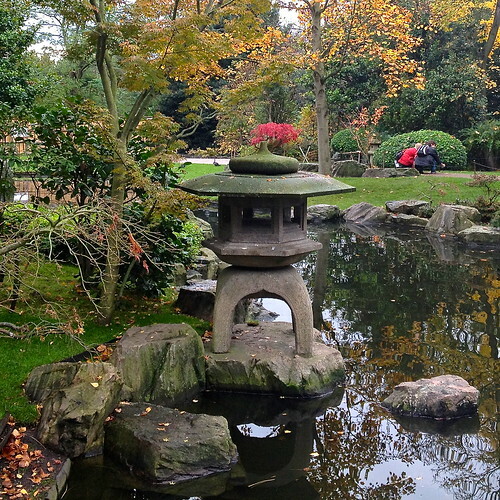 The garden contains four different stone lanterns – the buried lantern, the moveable lantern (though it didn’t look very moveable to us), the snow-viewing lantern which rests on four legs (though usually this type of lantern only has three with two in the water and one on the ground) and the pedestal lantern which has a picture of a deer on it, linking it to Nara which is near Kyoto. If you’ve ever been to Nara you’ll remember the deer which wander the park accosting tourists for food. 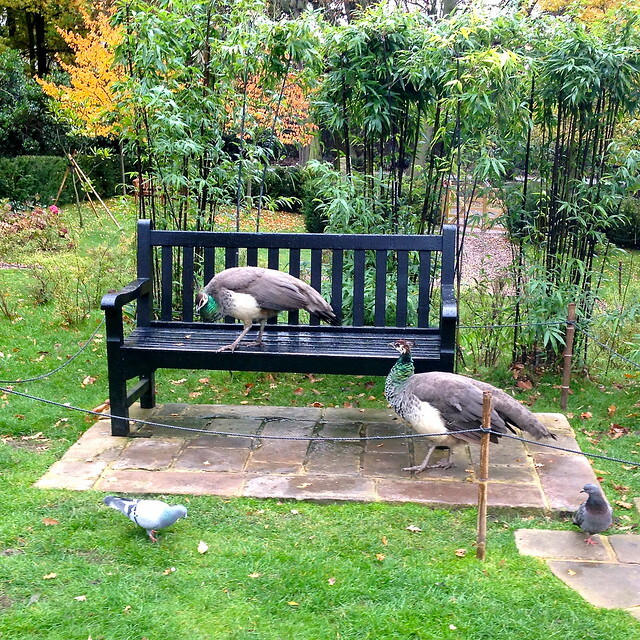 Of course the famous Holland Park peacocks made several guest appearances. 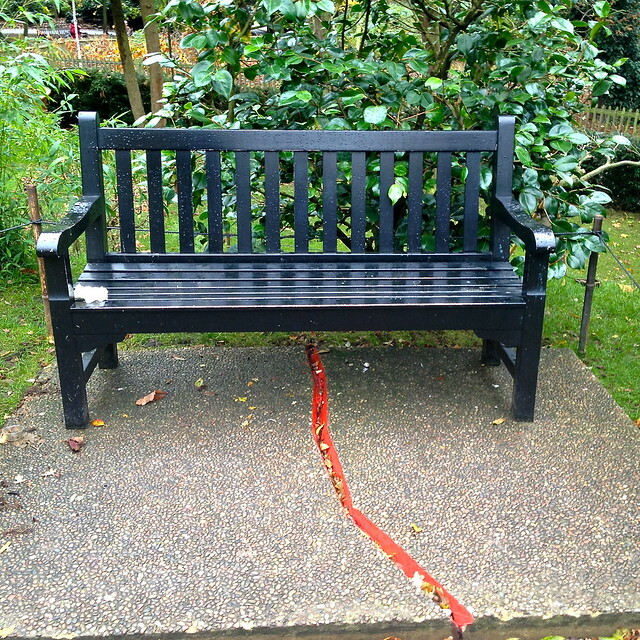 A moving new addition to the garden was the cracked plinth beneath the bench next to the path to the Fukushima Garden, which Yannick told us represented the Tohoku earthquake. 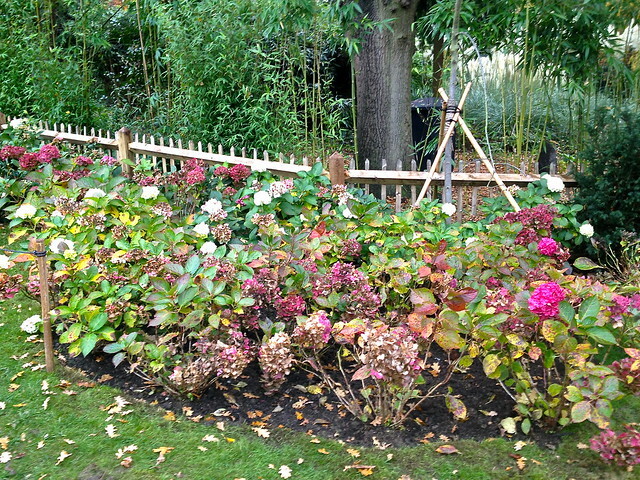 I was happy to see the hydrangeas in the Fukushima Garden were still blooming. 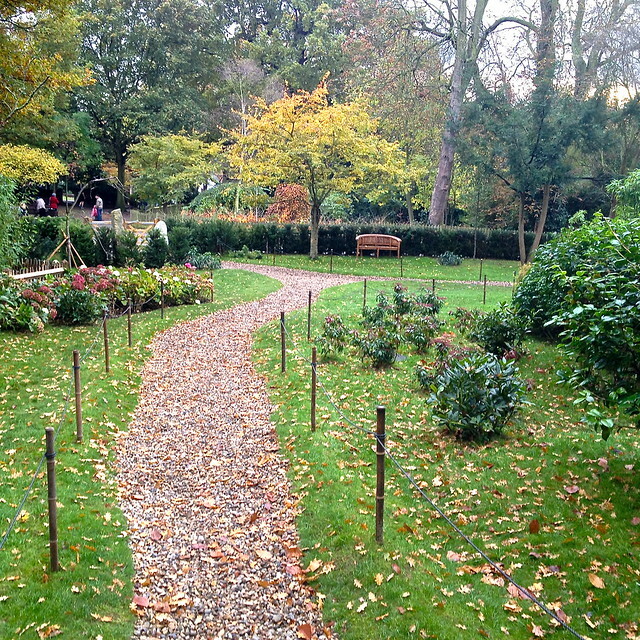 The view from the top of the hill helps you appreciate the river-like winding of the path. Yannick showed us the remains of Holland House (now a Youth Hostel) as it is today and pictures of it in its heyday. It’s sad so little of it is left, but at least it nowadays forms a backdrop for the summer operas in the park. Our tour ended, as all good tours should, in the cafe for tea. As we parted we all agreed we had had a wonderful afternoon. 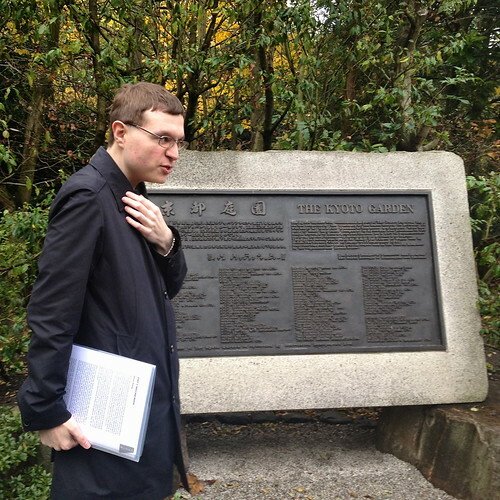 If you want to join one of Yannick’s tours you can book here or contact Yannick on Twitter – He’s @ypldn. 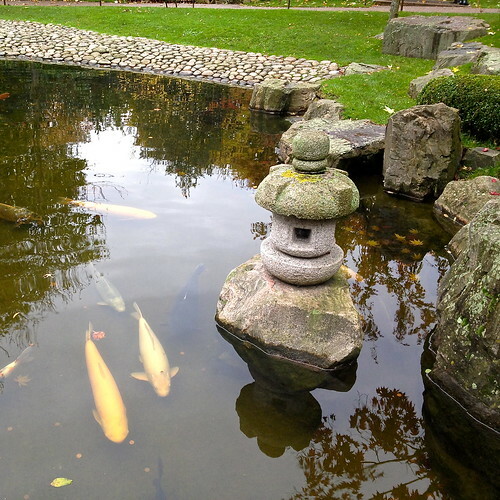 This entry was posted in Holland Park, Japanese Gardens and tagged Fukushima Garden, Kyoto Garden, London, Lord Holland, Tohoku earthquake by Fran. Bookmark the permalink. Thanks! I can recommend Yannick’s tour too. I’m going to sign up for this – sounds really interesting! Oh, please do – I’m sure you’ll enjoy it. I learned a lot. 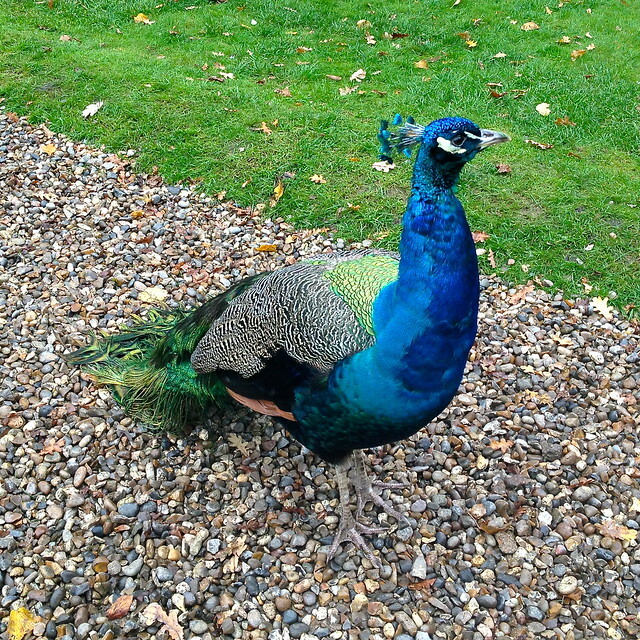 And the peacocks always make an appearance! I’ll see what I can do. The fish certainly looked very healthy when I was there last week.